2 cost for those icons and skill is good. Investigator has potential, though I'm not seeing how you'll get a lot of synergy for this and dreamlands supports in 1 deck. Without the cost reduction this is bland and inefficient, with the reduction this a good character. Not every faction has access to dreamlands support cards, unless you go for the neutral cards which take up a restricted spot or are utter rubbish. 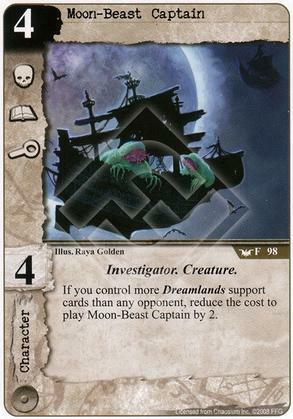 Sadly the factions with investigator synergy have the least access to dreamlands support cards. You are probably going to see this in hastur dreamlands decks instead of investigator decks. Moon-Beast Captain is awesome against any opponent who wants to blank your text boxes. This character is 5-stars in my anti-Frozen Time deck.